Bobi Wine has completed arrangements for his concert set for October 15 at his beach in Busabala. Photo by Paul Ibanda. 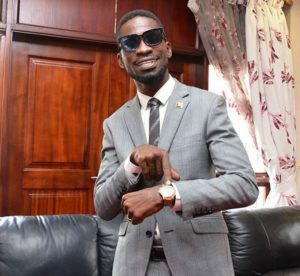 Kyadondo East legislator Robert Kyagulanyi Ssentamu aka Bobi Wine has completed arrangements for his concert set for October 15 at his beach in Busabala. It is his first concert since he joined the 10th Parliament. The concert dubbed ‘Specioza’ will feature several top artistes, including Dr Jose Chameleone, Dr Hilder man, Gravity omutujju, Catherine Kusaasira, Cindy and Nubian Li, among others. Talking to PML Daily this morning, Bobi Wine said he can never abandon music because it is his profession. “Music got me from the ghetto and made me who I am today. Being MP is just a responsibility bestowed upon me by many people, including the ghetto youths,” he said. The self-proclaimed ghetto president also spoke about the succession battle to his throne as ghetto president. “I don’t think ghetto presidency is a rank. Let the ghetto youths never be misled. Being a ghetto president means acting responsibly in the society and standing for the aspirations of the down trodden. Once you do that, you are either a ghetto leader or an ambassador. Therefore, everyone can be a ghetto president,” he said. PML Daily recently reported about the feud featuring three ghetto gladiators namely Bucha Man, Kabaaya and Omuyaye Ganja, with each of them claiming to be the rightful heir to Bobi Wine’s ghetto presidency.